The Greek Orthodox Metropolis of San Francisco oversees the western region of the Greek Orthodox Archdiocese of America. There are more than 150,000 members in the Metropolis led by His Eminence Metropolitan Gerasimos who leads the Greek Orthodox faithful in the states of Alaska, Arizona, California, Hawaii, Nevada, Oregon and Washington. The annual budget of the Metropolis is $738,000 which must provide for the oversight of 69 parishes and missions, and three monastic communities. There are several ministries within the Metropolis, all managed by volunteers. These ministries generally rely on their own limited funds, and most receive no direct support from the Metropolis due to budgetary constraints. These ministries include: AIDS/HIV, Church Music, Family Wellness Center, Folk Dance Festival, Greek Language Education, Kids ‘N Cancer , Religious Education and Christian Formation, and a wide range of Youth Development programs. Since the Greek Orthodox Archdiocese of North and South America was established in 1927, the Diocese of San Francisco has been one of its important components, although her boundaries have shifted from time to time, and likewise its Holy See has shifted between Los Angeles and San Francisco. The growth of this Metropolis has been continuous. In 1979, the Diocese of San Francisco numbered 47 parishes. There are now 57 fully chartered parishes, as well as eight missions in various stages of development. Three vibrant monastic communities have also been founded in the Metropolis: St. Anthony’s Monastery in Florence, Arizona; the Holy Convent of the Theotokos the Life Giving Spring in Dunlap, California (of which the official opening of the new Katholikon was held in August of 2003); and the Holy Convent of St. John the Forerunner in Goldendale, Washington. 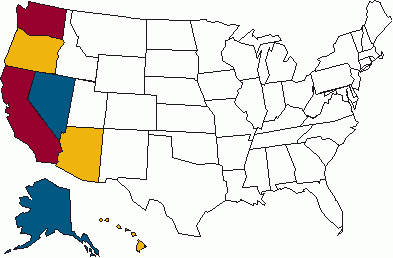 The 69 communities are established in seven states: Alaska, Arizona, California, Hawaii, Nevada, Oregon, and Washington. Through the seven decades since the Greek Orthodox Archdiocese of North and South America took its present form, the Metropolis of San Francisco has been one of its important components, though its boundaries have shifted from time to time, and likewise its seat, between Los Angeles and San Francisco. The seat has had a number of distinguished occupants: Bishop Kallistos (Papageorgapoulos 1927-1940), and Bishop Eirinaios (Tsourounakis 1941-1944) both bore the title of bishop of San Francisco. Bishops Athenagoras (Kokkinakis 1950-1955), Demetrios (Makris 1955-1968), and Meletios (Tripodakis 1968-1979) were titular bishops (of Elaia, Olympus, and Christianoupolis, respectively). The election of Bishop Anthony (Gergiannakis, 1979-2004) in 1979 coincided more or less with the canonical restructuring of the Archdiocese. Having served one year in the Diocese of Denver as Titular Bishop of Amissos, he was enthroned on June 7, 1979, as the Bishop of San Francisco. On November 24, 1997, the Holy and Sacred Synod of the Ecumenical Patriarchate elected His Grace Bishop Anthony as Metropolitan of the Dardanelles and Exarch of all Hellespont. In September 2002, the Diocese of San Francisco was declared the Holy Metropolis of San Francisco, and Metropolitan Anthony was named as Metropolitan of San Francisco. Following the passing of Metropolitan Anthony on December 25, 2004, the Ecumenical Patriarchate of Constantinople elected His Eminence Gerasimos, formerly Bishop of Krateias, as Metropolitan of San Francisco.